The International Date Line has confused explorers, navigators, and everyday travelers since humans began circumnavigating the globe nearly five centuries ago. The first men to sail around the world with Ferdinand Magellan arrived in Spain in 1522, to their surprise, one day later than they had accounted for in their logs(1). As recently as 2007, the International Date Line single-handedly crippled one of the world's most advanced stealth fighters. Six US Air Force Lockheed F-22 Raptors were forced to turn around on their flight from Hawaii to Japan because crossing the Date Line scrambled the codes in their computer systems, crashing their navigation and fuel monitoring systems. (2) The Date Line even plays a key role in the plot of Jules Verne's Around the World in Eighty Days, in which Phileas Fogg and his crew return to London (what they believe to be) one day too late to win their bet, when, in fact, they are just in the nick of time. (3) And what modern day vacationer hasn't puzzled over the dates and times of their trans-Pacific flights? The International Date Line is not, of course, a real thing. It is a conceptual necessity when accounting for multiple time zones around the world, and especially when circumnavigating the globe. It is also an unavoidable factor when accounting for the date in celestial navigation if you are traveling across it. 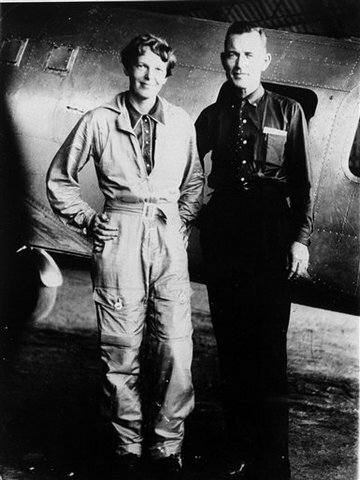 On July 2, 1937, Amelia Earhart and her navigator Fred Noonan took off from Lae, New Guinea on what was to be the third-to-last leg of their World Flight. During the 20+ hour journey, Noonan would use dead reckoning and celestial navigation to guide them more than 2,500 miles across an empty Pacific Ocean to a 1-mile-long spit of land named Howland Island. After nearly 18 hours flight and roughly 2300 miles closer to Howland, they would cross the International Date Line. (4) Is it conceivable that this Circumnavigator’s Paradox caused Fred Noonan the same trouble as so many before (and after) him? The Date Line Theory lays out the possibility that such a navigational error due to the crossing of the International Date Line during the World Flight perhaps did cause Amelia Earhart and Fred Noonan to improperly ascertain their location and aim for a Howland Island that lay in the wrong place. NEXT: What does the Date Line have to do with Celestial Navigation? 4. Long, Elgen M. and Marie K. Amelia Earhart: The Mystery Solved. New York: Simon & Schuster, 1999. Copyright Liz Smith 2010. Watermark theme. Powered by Blogger.